1. 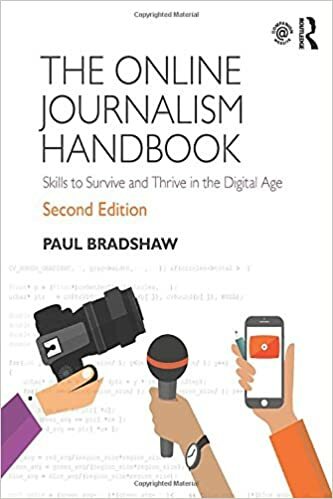 You have written that people read blogs and other user generated content because they trust the person not the brand; they link or contribute to that content because ‘a journalist invested social capital’ and trust is related to their reputation, knowledge and connections. In a sense I guess reputation, knowledge and connections is what also underpins trust in curated content (e.g. Storyful). 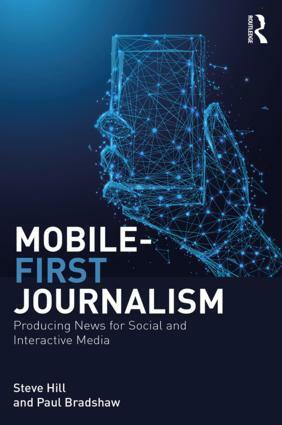 My question is whether this informal reliance on the dynamics of social capital is enough to differentiate what Storyful refers to as the ‘news from the noise’ both for ‘curated’ news and online journalism more widely. Or would, for example, a self-regulatory Code be helpful in making this differentiation transparent? I think a more sophisticated way of looking at this is that people draw on a range of ‘signals’ to make a judgement about the trustworthiness of content: that includes their personal history of interactions with the author; the author’s formal credentials, including qualifications and employer; the author’s network; the author’s behaviour with others; numerous other factors including for example ratings by strangers, friends and robots; and of course the content itself – is the evidence transparent, the argument /narrative logical, etc. A self-regulatory Code would add another signal – but one that could be interpreted either way: some will see it as a badge of credibility; others as a badge of ‘sell-out’ or pretence to authority. The history of previous attempts suggest it would not particularly succeed. I’m by no means an expert on trust – would be interesting to explore more literature on that. 2. The PCC has welcomed online journalists to join it – is there interest among the online journalism community? I appreciate the level of antipathy expressed in the blogging community when this was raised late 2009, but I wonder whether the current consultation in relation to live electronic communications for court reporting by accredited journalists could raise the significance of notions of accreditation (through the PCC or independent to it) for online journalists. Many people blog precisely because they feel that the press does not self-regulate effectively: in a sense they are competing with the PCC (one academic described bloggers as ‘Estate 4.5’). It has a bad reputation – to stand any change of attracting bloggers it would have to give them a genuine voice and incorporate many of the ethical concerns that they have about journalism. I don’t see that happening. Accreditation is a key issue, however – or at least respectability to advertisers; some bloggers are moving away from calling themselves ‘blogs’ as they look for more ad revenue. But they are a minority: most do not rely on ad revenue. As access to courts and council meetings is explicitly widened, accreditation is less of a problem. 3. If on-line journalists were to consider self regulation what would be the key principles that might inform it: accuracy, fairness, privacy? What of harm and in particular protection of the under 18’s? Or are such notions irrelevant in the world of social capital? This post – http://paulbradshaw.wpengine.com/2011/03/07/culture-clash-journalisms-ideology-vs-blog-culture/ – is a good summary of how I think the two compare. Most bloggers see themselves as fiercely ethical and you will frequently see them rise up to defend the vulnerable – sometimes unaware of their intimidatory power in attacking those they see as responsible. 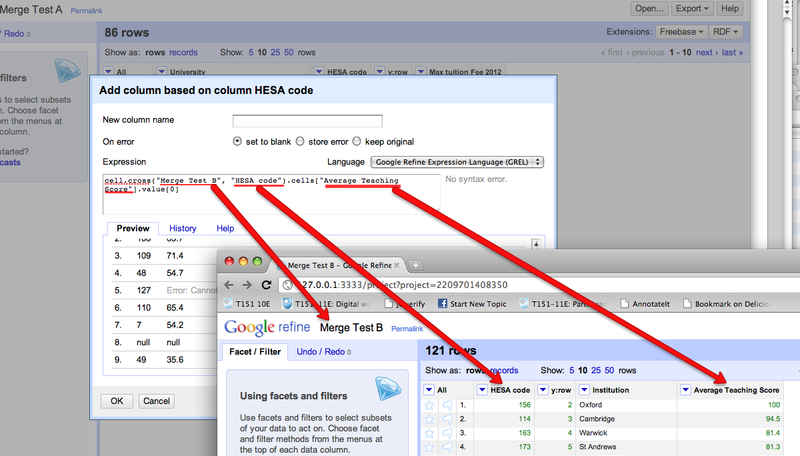 You will also see them correcting inaccurate reporting. If anything these notions are more important in a world of social capital: my accuracy, fairness and treatment of the vulnerable dictates part of my social capital. If I make a mistake, my social capital can be damaged for a long time to come – we don’t yet have any concept of our social crimes ‘expiring’ online. This entry was posted in faq, online journalism, regulation on May 21, 2011 by Paul Bradshaw. A Very Dangerous Doctor is a Channel 4 documentary about David Southall, the controversial doctor who was struck off after “abusing his position” in accusing a mother of killing her son. The documentary includes CCTV footage of parents smothering their children, filmed covertly as part of Southall’s research into cot deaths. The footage is incredibly distressing – the Independent rightly describe it as “among the most shocking to be shown on TV”. Many tweeted that they were switching off the 100-minute broadcast – barely five minutes in – as a result. The documentary is an excellent piece of work, and worth watching in full – but the CCTV footage raises an old ethical issue in a new context: is it justified? There is a wealth of literature on the ethics of war reporting: whether distressing images should be shown, and the arguments for and against. The spread of CCTV and mobile phone footage, its accessibility and its release by police authorities and availability on YouTube, raises similar questions – whether it is footage of a woman throwing her baby on the floor, race attacks, or the death of a protestor. What are the questions to ask when you are given such footage? What are the ethical issues to balance? And what about this specific example (the footage begins around 04’25)? I’d love to know what you think. This entry was posted in regulation, television and tagged a very dangerous doctor, Channel 4, david southall, documentary on May 12, 2011 by Paul Bradshaw. In the above case, where am I creating a new column based on the contents of the Institution column in Merge Test C, I’m using a couple of string processing tricks… The GREL expression may look complicated, but if you build it up in a stepwise fashion it makes more sense. The fingerprint() function then separates out the individual words that are left, orders them, and returns the result (more detail). 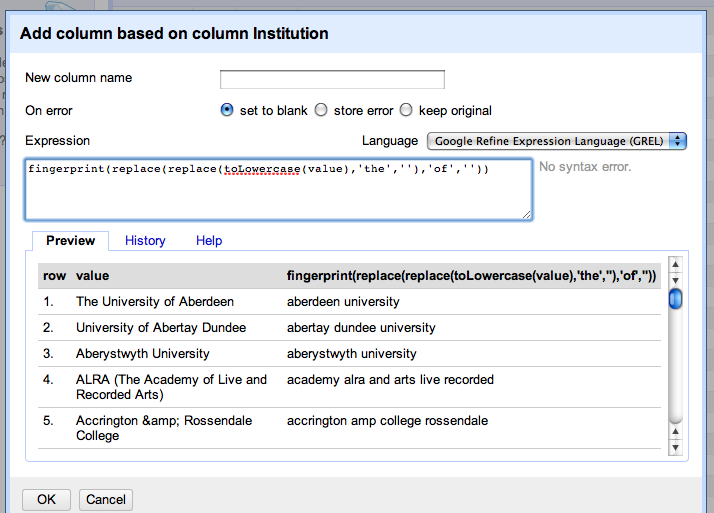 Can you see how this might be used to transform a column that originally contains “The University of Aberdeen” to “aberdeen university”, which might be a key in another project dataset? 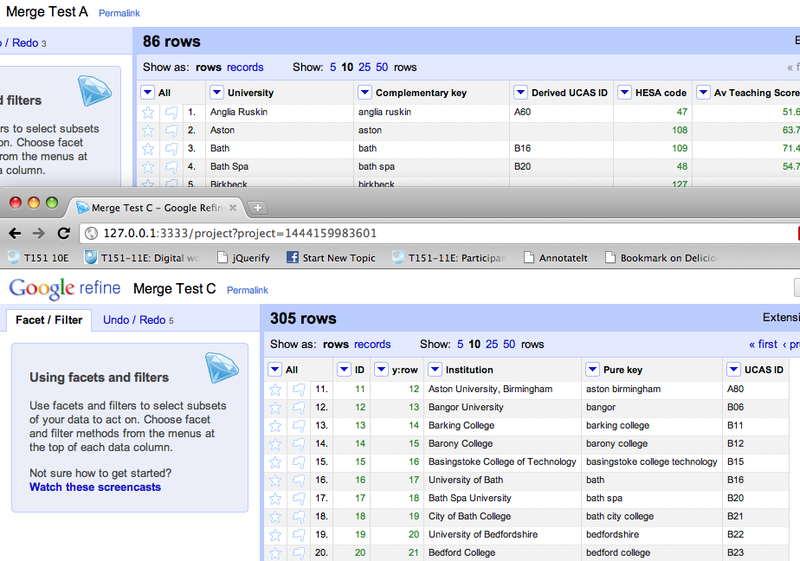 When trying to reconcile data across two different datasets, you may find you need to try to minimise the distance between almost common key columns by creating new columns in each dataset using the above sorts of technique. This entry was posted in data journalism and tagged data, google refine, onlinejournalismblog, Tinkering, tony hirst on May 6, 2011 by Paul Bradshaw. This entry was posted in data journalism and tagged data, onlinejournalismblog, tony hirst, visualisation on May 5, 2011 by Paul Bradshaw. This entry was posted in data journalism and tagged data, google refine, onlinejournalismblog, Tinkering, tony hirst on May 4, 2011 by Paul Bradshaw.